There has always existed the need for an oil color for the professional and for the student with all the handling qualities and characteristics of a true oil color, but without the negatives of the traditional medium. The production of a water soluble oil color has been solved by different manufacturers in different ways, though not all seem to have the qualities of true oil color. Holbein’s objective in formulating DUO Aqua Oil Color was production of a genuine oil color for the professional, with the same qualities and characteristics of the traditional Holbein Artist Oil Color, certainly one of the world’s finest. 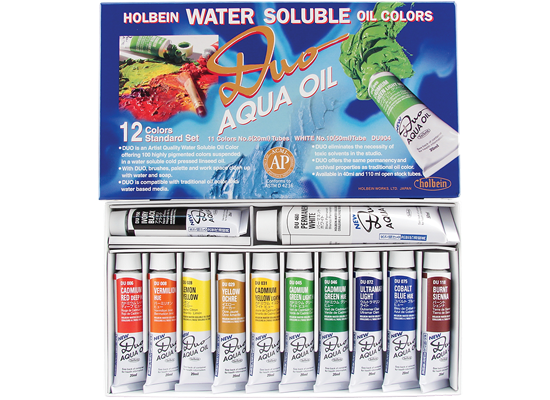 DUO Aqua Oil Color is water soluble, but the oil is identical to that used in Holbein Artist Oil Color. There is no special treatment. There is no modification or breaking down (cracking) of the oil. There is no water in the product, only the additive that is rendered redundant and of no effect in the drying process. The surface agent covers the pigments and oil, this making both water sensitive or soluble. That is all. There is no other ingredient present. If the artist does not wish to use water, DUO may be used as a traditional oil color and the result will be the same. DUO blends and mixes naturally with traditional oil color and traditional oil mediums although water solubility is lost if traditional oils or mediums exceed 30% of the mixture. DUO is not classified as a water base color, like gouache, acryla gouache, watercolor or acrylic, but all these blend perfectly with DUO while wet (add a few drops of water when blending with acrylic). While drying time will vary depending upon application (thin or Impasto) and/or the humidity or airiness of the air, the following will apply to general use of DUO. When mixed with water DUO starts to dry slowly and after the water dries out, the oil that remains continues to dry by oxidation in the same manner as traditional oil and with the same result. While still wet, the paint will have somewhat reduced transparency. When the water evaporates, full transparency will return to match the traditional counterpart exactly. When blended with water alone, DUO will dry to a slight matte finish in less time than traditional oil applied after blending with an oil medium. A finished work should not be varnished for 6 to 8 months depending on the climate. 17 “Elite” labeled colors signify the use of heavy metal pigments including cadmiums and cobalts. Colors labeled Elite are: Cadmium Red, Cadmium Red Deep, Cadmium Orange, Cadmium Yellow Deep, Cadmium Yellow, Cadmium Yellow Lemon, Naples Yellow, Cobalt Green Light, Cobalt Green Deep, Cadmium Green, Cadmium Green Light, Cobalt Turquoise, Manganese Blue Nova, Cerulean Blue, Cobalt Blue, Verditer Blue and Cobalt Violet. Permanent White **** A titanium white with the same general handling qualities but with a barium sulphate additive which inhibits yellowing in early drying while reducing tinting power and increases transparency. Drying time is comparable to traditional oil straight out of the tube (no water/mediums). Water Will matte down the surface when mixed with DUO, like turpentine does to oil. Quick Dry Medium or Painting Oil is ideal for glazing. Traditional oil mediums may be used, but mixture will lose water solubility. Traditional oil painting techniques apply for DUO (fat over lean). 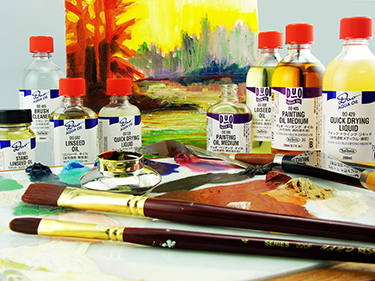 Water aids when mixing DUO with other water base media (watercolor, gouache, acrylic), to ensure a durable finish. Use traditional oil varnish when sealing your DUO painting. A stiff synthetic brush is best when painting DUO. Holbein offers a variety of DUO Mediums to meet the demands of today's Artists.